A woman on New York’s Mohawk Reservation takes up illegal-immigrant smuggling to survive. 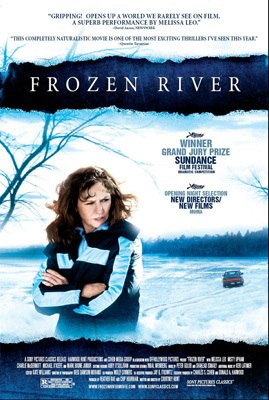 A desperate single mother living in upstate New York resorts to smuggling illegal immigrants into the United States as a means of making ends meet in first-time feature director/screenwriter Courtney Hunt’s emotionally wrenching drama, winner of the Grand Jury Prize for Best Dramatic Feature at the 2008 Sundance Film Festival. Ray Eddy is in an impossible position; it’s two days before Christmas and her husband has suddenly disappeared with all of the family savings. Now, as the newly single mother of two realizes the futility of attempting to cover the house payments on her meager Yankee One Dollar Store wages, her children are forced to exist on a nutritionally devoid diet of popcorn and Tang. Deciding that her only hope for survival is to find a man who will support her and her children, Ray sets out to find a husband but instead makes the acquaintance of street-smart Mohawk Lila Littlewolf. Lila, too, has been struggling to keep her head above water amidst economic despair, and has recently stumbled across a rather unconventional solution to her dire financial situation. Lately, Lila has been earning a living by smuggling illegal immigrants into the U.S., but her tribal elders vehemently disapprove of the scheme and have recently attempted to stop it by forbidding the local auto dealers from selling her a car. As fate would have it, Ray’s Dodge Spirit may just be the only thing the destitute mother can count on anymore, and as this unlikely pair gas up the tank for a daring dash across the iced-over St. Lawrence River, their fates become forever intertwined in ways that neither could have ever anticipated. This entry was posted on July 31, 2008 at 4:53 am and is filed under Movies with tags Crime, drama, Gangster. You can follow any responses to this entry through the RSS 2.0 feed. You can leave a response, or trackback from your own site.